Predicted docking of HepIn-13 (ball and stick model) within the catalytic pocket of Hepsin (grey). Image from Tang, et al., 2014. If treated early, prostate cancer is usually curable. After metastasis occurs, however, these tumors become resistant to treatment and are generally fatal. Therefore, inhibiting metastasis may significantly improve the survival time for patients with prostate cancer. The Vasioukhin laboratory has previously shown that the host serine protease Hepsin promotes prostate cancer progression and metastasis using an in vivo mouse model (Klezovitch, et al., 2004). Furthermore, the level of Hepsin overexpression in prostate tumors is inversely correlated with clinical outcome. These findings suggest that Hepsin may be an excellent target for new chemotherapeutics. Supporting this hypothesis in a recent paper published in Oncotarget, Drs. Xi Tang and Valeri Vasioukhin (Human Biology Division) and their collaborators demonstrate that a novel small molecule inhibitor of Hepsin, HepIn-13, can prevent metastasis in a prostate cancer model system. The Vasioukhin laboratory has identified several Hepsin inhibitors for use as lead compounds in drug development (Chevillet, et al., 2008). In the current study, Tang and colleagues screened a collection of chemical derivatives of a lead compound and identified six small molecules that are potent and specific hepsin inhibitors in vitro. The team next tested the pharmacokinetics of these candidate compounds in vivo and found that all six compounds had similar half-lives. However, only one compound, HepIn-13, was detectable in the blood after oral administration of the compound. Therefore, the team focused on determining the activity of HepIn-13 in a prostate cancer model system. To assess the impact of HepIn-13 on prostate cancer progression in vivo, the authors employed a unique mouse-based model of prostate cancer that expresses Hepsin and consistently metastasizes to bone. HepIn-13 was administered to mice in their food at one of two different concentrations that resulted in blood concentrations above the previously determined IC50. Thirteen weeks after treatment was initiated the team did not identify any difference in primary prostate tumors in either the control or treated mice (mean tumor size = 2.1 +/- 3.3 g (control) v 1.9 +/- 2.0 g (treated)). Excitingly, HepIn-13 significantly reduced the occurrence of metastases over the course of the study. While 66% of control mice developed metastases, mice treated with high dose HepIn-13 did not develop any metastases and only 30% of low-dose treated developed metastases. This study supports the hypothesis that inhibition of Hepsin may be an effective target to prevent metastasis of prostate cancer. Beyond prostate cancer, Hepsin is also overexpressed in a variety of other cancer types, raising the possibility that Hepsin inhibition may broadly inhibit the progression of several cancers. "One significant limitation of our compound is relatively poor oral bioavailability. This will need to be improved on before this compound can be used in people," said Dr. Valeri Vasioukhin. Tang X, Mahajan SS, Nguyen LT, Béliveau F, Leduc R, Simon JA, Vasioukhin V. 2014. Targeted inhibition of cell-surface serine protease Hepsin blocks prostate cancer bone metastasis. Oncotarget. 1352-62. See also: Chevillet JR, Park GJ, Bedalov A, Simon JA, Vasioukhin VI. 2008. 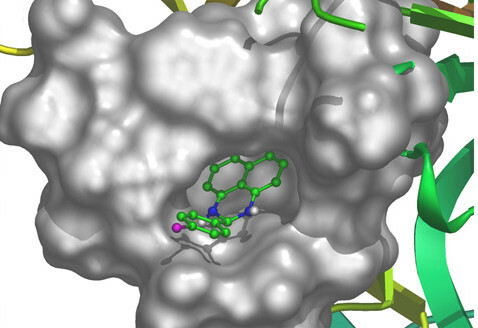 Identification and characterization of small-molecule inhibitors of hepsin. Mol Cancer Ther. 3343-51. See also: Klezovitch O, Chevillet J, Mirosevich J, Roberts RL, Matusik RJ, Vasioukhin V. 2004. Hepsin promotes prostate cancer progression and metastasis. Cancer Cell. 185-95.